Please note. : For inquiries please use our > inquiry form to avoid transmission error of e-mailaddresses and accelerates the process. The information on this Internet site is provided by Plastiskop "as is" and to the extent permitted by law, is provided without warranty of any kind, expressed or implied, including but not limited to any implied warranties of merchantability, fitness for any particular purpose, or non-infringement. While the information provided is believed to be accurate, it may include errors or inaccuracies. This Internet site contains links to external sites, which are not under the control of Plastiskop. Therefore we are not responsible for the contents of any linked site. Plastiskop is providing these links to you only as a convenience, and the inclusion of any link does not imply endorsement by Plastiskop of the linked site. Copyright 2018 Plastiskop. All Rights Reserved. The text, images, graphics, sound files, animation files, video files and their arrangement on Plastiskop Internet sites are all subject to Copyright and other intellectual property protection. These objects may not be copied for commercial use or distribution, nor may these objects be modified or reposted to other sites. 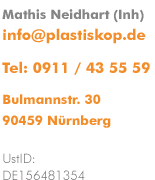 Some Plastiskop Internet sites also contain material that is subject to the copyright rights of their providers.